As we head into fall, sweet potatoes and soups go on the menu at our house. I love soups because they are generally quite simple to make. This sweet potato soup requires only 10 minutes of work and 20 minutes of waiting – simple indeed! But the flavor belies its ease. 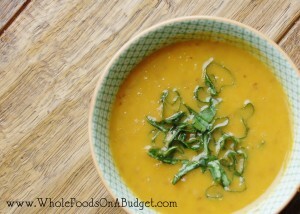 The soup is rich with sweet potato flavor and balanced by hints of coconut and spicy ginger. Your kitchen will smell wonderful! Dice the sweet potatoes into ½in. pieces. Mince the fresh ginger root (or grate it, if you prefer). Dice the onion. Add all of this to a soup pot along with the coconut oil. Over medium high heat, stir occasionally while the vegetables begin to cook and soften. The aroma is just lovely!! Once the onions turn translucent, add the chicken stock and turn the heat to high to bring to a boil. Skim off any foam. Partially cover the soup pot with a lid and turn the heat to medium-low, allowing the soup to simmer for about 20 minutes or until the sweet potatoes are soft. At this point, some of the liquid should have evaporated out, and that’s just what you want. Using an immersion blender, puree the soup. I prefer to only puree the soup partly, leaving some chunks for a bit of a chunky texture – but that’s really up to you. If you want a completely smooth soup, by all means, have at it! When you are done pureeing the soup, add the coconut milk and stir to thoroughly incorporate it. This is the most delicious soup! Followed recipe without any alterations. Perfect.